WILLEMSTAD - The focal point of the government is that the refinery must stay open after the year 2019. This is the reason why the Council of Ministers, during its weekly meeting held on November 1, made the decision regarding the negotiations with Guangdong Zhenrong Energy (GZE). The Ministers also discussed the role of the Venezuelan company PDVSA in the future of the refinery, a possible fallback position to guarantee the modernization of the refinery and the realization of an LNG terminal. The Council of Ministers agreed that Prime Minister Eugene Rhuggenaath should continue negotiating with Venezuela on PDVSA’s participation in the future of the refinery. Very important in this is that the government wants clarity about the role PDVSA will have in the Heads of Agreement that was signed with GZE. Cooperation with PDVSA is also important because of the information that is needed for the modernization of the refinery and a stable transfer to the future operator. Furthermore, the Council of Ministers stressed that a due diligence is needed to get clarity on the capacity of GZE and its strategic partners. It is important to know if GZE has the financial and technical capability to operate the refinery. The Council of Ministers did not agree with the transfer of the development of the LNG terminal in Bullenbay from the company that won the public tender, which is Titan, to GZE. The Government has asked Refineria di Korsou, Curaçao Refinery (RdK) to inform Titan about this decision. RdK must also ask them if they are willing to continue with this project and if they have the financial resources and the technical capability to execute it. 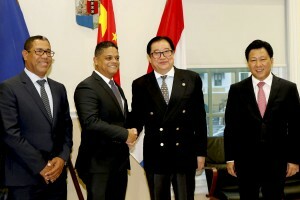 On the same line, the Council of Ministers requested the Multi-Disciplinary Project Team (MDPT) to initiate a process to reach a so-called backup plan which consists of alternative plans for all possible scenarios during the modernization process of the refinery, including Bullenbaai, as well as the construction of the LNG terminal at Bullen Bay. The Government will wait on the report of the accountants’ bureau (SOAB) to make a decision about the new structure for the MDPT.